Happy holiday homes make happy memories; memories that are shared among family and friends for generations, and that encourage return visits year after year. Therefore creating the perfect holiday home is about more than adequate comfortable accommodation, it is the stage on which holiday memories are made. Each holiday home is unique to its visitors; rich with personal touches, captured memories and idiosyncrasies, but there are some basic guidelines to designing, decorating and finishing the perfect holiday home. AMERICAN shutters® recently had the great pleasure of installing our Decowood shutters and wooden slat blinds in a beautiful home in Kalk Bay, Cape Town. The style and practicality of this home make it an ideal holiday home. If it is a cabin in the mountains, or a beach cottage, a chic modern apartment or house like this Kalk Bay home, be sure to work with what you have. 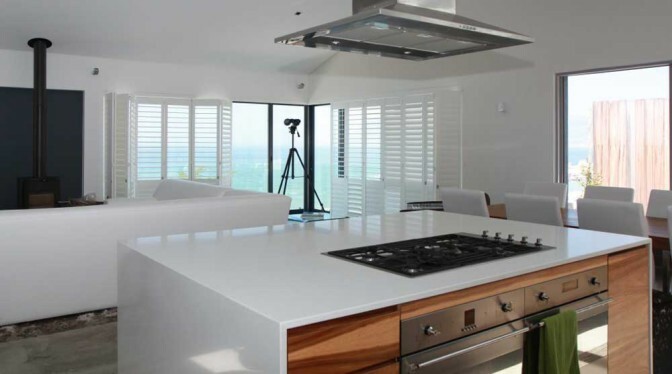 Maximise the views just as these homeowners have done by installing bi-fold Decowood shutters; easy to fold away to open up the home and enjoy the panoramic sea view. Opt for flooring, surfaces, furniture and finishes that are practical, hard wearing, easy to clean, and that will not date or need replacing often. Wooden shutters are ideal for holiday homes due to their timeless decor quality, practical functionality – whether it be light and ventilation control on hot summer days, privacy for quieter moments, or opening up to merge the indoor and outdoor spaces of the holiday home – and the value they add to the property value. A holiday is quickly ruined if each night needs to be spent in an uncomfortable bed that leaves you aching and weary the next morning, so ensure that all visitors have a comfortable clean bed with fresh crisp linen to sleep in. 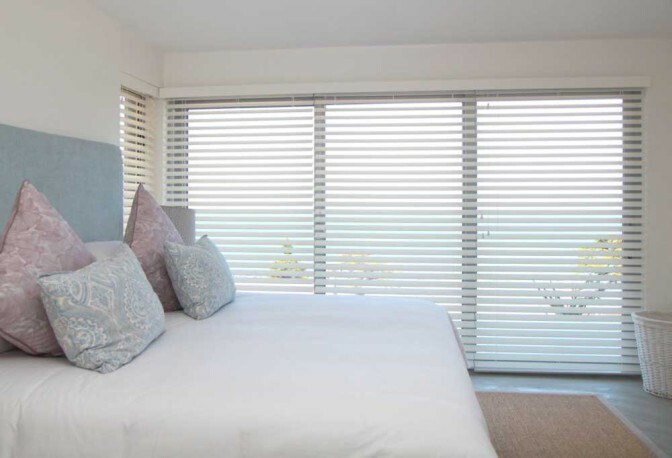 The wooden slat blinds installed in the Kalk Bay home’s bedroom keep the room cool during those long summer holiday days and offer the privacy that is so important in this personal space. Make sure you have ample cupboard space to store holiday gear so that your lovely home does not always look cluttered and messy. Holidays are about celebrations and spending time together, a big welcoming table is a must for those family feasts on special holidays and entertaining friends over long weekends. 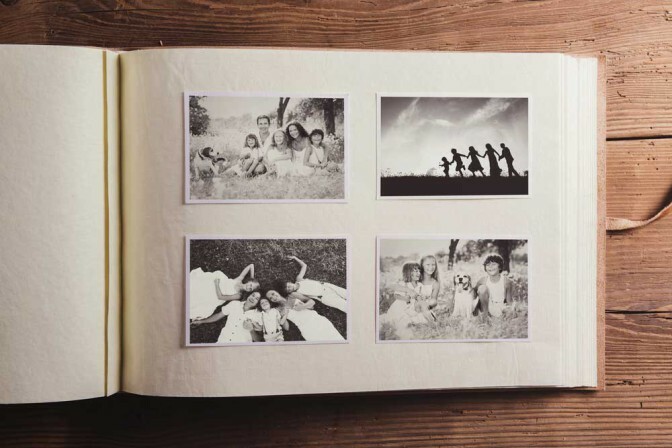 A holiday home is not a hotel, it is a personal space that should showcase the homeowners’ unique style, so don’t be reluctant to add a personal touch to the decor, perhaps even using the keepsakes and photographs from previous holidays enjoyed with loved ones in the home. Follow these guidelines on how to create the perfect holiday home, then just add lots of love, smiles, laughs and good times, mix well and enjoy. Happy holidays!